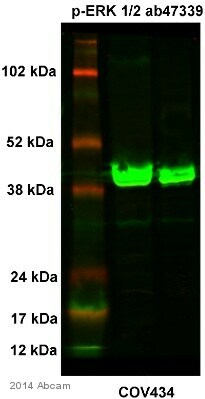 A synthesized phosphopeptide derived around the phosphorylation site of ERK1 tyrosine 204 and ERK2 tyrosine 187 (T-E-YP-V-A). Our Abpromise guarantee covers the use of ab47339 in the following tested applications. WB 1/500 - 1/1000. 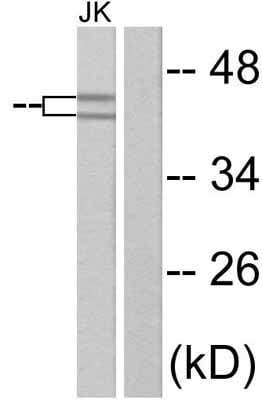 Detects a band of approximately 44, 42 kDa (predicted molecular weight: 44, 42 kDa). Ab47339 staining human normal or colon tissue. Staining is localised to cytoplasm. Publishing research using ab47339? Please let us know so that we can cite the reference in this datasheet.